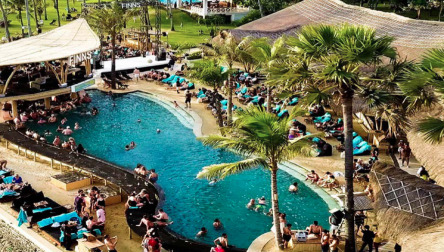 You're invited to laze away the day in the sun from the comfort of single and double day beds on a white sand beach or swim in a stunning 30 metre infinity edge pool with swim up pool bar. The striking bamboo structure was specifically designed to allow every guest to have a guaranteed sunset view. 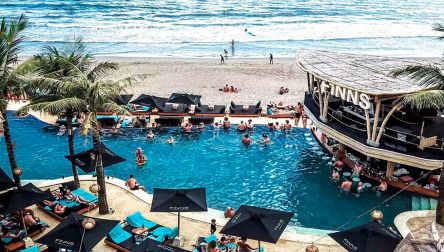 Enjoy the unbeatable 180 degree ocean views whilst listening to the cool tunes from Resident DJ’s from 1pm. Towels available at Rp 50,000 per day. 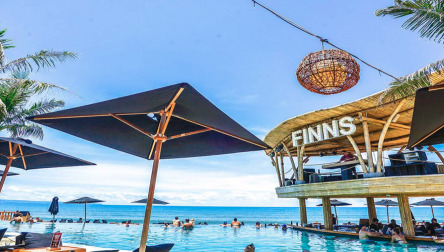 We hope you enjoy your Pool Day Pass at FINNS Beach Club.You're invited to laze away the day in the sun from the comfort of single and double day beds on a white sand beach or swim in a stunning 30 metre infinity edge pool with swim up pool bar. We hope you enjoy your Pool Day Pass at FINNS Beach Club.